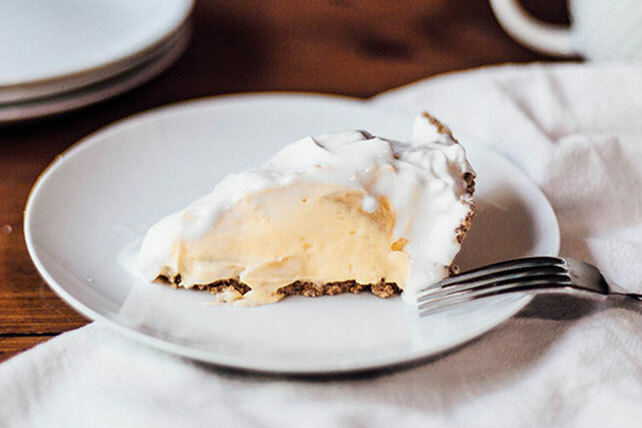 Good news: There's a better-for-you version of your favorite banana cream pie recipe, and it's as easy as the original. No need to wait for a special occasion to make a banana pie! Place half of the banana slices on bottom of crust. Set remaining banana slices aside. Pour milk into large bowl. Add dry pudding mixes. Beat with wire whisk 2 min. or until well blended. Gently stir in 1 cup of the whipped topping. Spoon half of the pudding mixture into crust. Top with remaining banana slices; cover with remaining pudding mixture. Refrigerate 3 hours or until set. Serve topped with the remaining 1 cup whipped topping. Store leftover pie in refrigerator.